Here at GOJoven International we are profoundly sad to learn of the tragic death of our dear colleague and GOJoven Alumni Fellow, Octaciano (Chano) Banegas Galeas. Chano passed away on June 30, 2018, during the treacherous journey from Honduras in search of a better life for himself and his family. Chano came from the small town of Tocoa, Colón, on the Atlantic coast of Honduras. In 2009 he became a Fellow of the Public Health Institute’s Youth Leadership in Sexual and Reproductive Health Program (GOJoven International), joining alongside his peers from Belize, Mexico and Guatemala. During his fellowship, Chano designed and implemented the Leadership Action Plan (LAP) called “Pienso, Siento y Actúo, Colón” with the other young leaders on the Atlantic coast. Their project increased the knowledge of local youth and reduced the rate of teenage pregnancies in the intervention area. They trained 500 young people in sexual and reproductive health issues, and as a result no adolescent pregnancies were registered in any of the target communities during the LAP implementation. 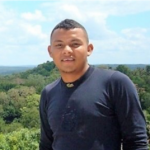 In 2013, together with other Fellows from the GOJoven Program, Chano founded the GOJoven Honduras Association and was part of the organization’s first Board of Directors (2013-2015). After finishing his term, he remained an active member of the organization’s General Assembly until today. His academic background was in Business Administration and Management and Social Development. He actively participated in numerous social projects in Tocoa, including an environmentalist student group organized by the International Municipal Environmentalists, as well as a program that designed and implemented housing for the elderly, and the World Doctors. He proved to be an excellent young leader who worked for several non-governmental organizations in support of the health and economic wellbeing of women, youth, children and men; including the Adelante Foundation and its mission of empowering female entrepreneurs with the opportunity to obtain economic independence and self-sustainability through small business and education loans. He also worked at the Wánigu Organization – “Our People” in the Garífuna language – a business initiative that provides financial support and the opportunity to achieve a better quality of life to families that in turn promote the generation of financial, social and cultural assets. In his role as Wánigu’s Credit Officer, Chano supported the delivery of credit service projects in the Atlantic Coast of Honduras and the Department of Atlántida. We always admired the energy, dedication and commitment shown by Chano to the people of his community with limited opportunities, including the Garifuna population, women, and young people and children. He was a talented young leader with a sense of curiosity and adventure; and wanted to do his part to transform his community, his society, his country and the region. It pains us to learn that, despite all his achievements and his deep commitment to his country, he faced the need to migrate to the United States to improve his economic opportunities and help support his family, and he tragically died in this dangerous trip. We express our indignation with the persistent economic and social inequalities that deeply divide the United States and Central America, as well as our rejection of unjust U.S. economic and immigration laws and policies that contribute to these types of tragedies, predominantly affecting youth and families who migrate in search of a better future. With the premature death of Chano, the GOJoven family has lost a wonderful colleague, friend and leader. We will never forget him, and we will continue to work in his name to improve living conditions and economic and leadership opportunities for Honduran youth, women, children and men. Rest in peace. We love you very much, Chano. ~Esther, Josie, Denise, Susanna, Angel, Julie and all the GOJoven Fellows from Honduras, Guatemala, Mexico and Belize. In order to help Chano’s family with the exorbitant cost of returning his body home to Honduras, we have started a GoFundMe campaign and would appreciate any and all donations. The money raised will help Chano’s family pay off the bank debt they incurred to bring his body home and pay him homage over the last three months, as well as help his wife and four-year-old son to cover basic expenses as they recover from their loss. Thank you very much, on behalf of Chano’s family and community, for your generosity and support.